Although one can see the profound influence of the Russian spirit in the Baroque cathedrals and palaces designed for the Romanovs by Western architects, no similar influence is evident in the works of the notable Italian and German composers they imported at that time. These worthies write in their national idiom and that is an end to it. 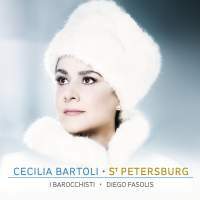 This is fortunate for Cecilia Bartoli, because I can’t think of another artist so removed from the emotional depth and breadth that characterizes the Russian temperament. It is also fortunate that only two pieces on this disc are sung in Russian, as her carefully executed, walking-on-eggs diction lacks the ring of authenticity. The opera arias presented here, all products of craftsmanship rather than inspiration, afford the singer ample opportunity to do what she does best: Her fioratura is stunning and her innate sense of legato quite impressive. Bartoli’s vocal quality is, as it has always been, of one unvarying color, and in the more sustained passages it bears an uncanny resemblance to the theremin, coincidentally invented by a Russian. As these arias are strictly entertainments Bartoli, a consummate entertainer, serves them up adroitly with her charm and bravura. However, one can’t say she is an actress of depth; she often gives the impression of a precocious youngster imitating the passions and mannerisms observed in adults. In an effort to breathe life into these weak, perfunctory compositions—that is, to keep a sinking ship afloat—soloist, orchestra, and chorus perform with much gusto, but their individual ideas of style are so disparate as to preclude any real sense of unity. I Barocchisti’s strings have not the slightest hint of vibrato, creating a pleasant glass harmonica effect. The other ensemble members play strictly into the center of the pitch as well, and the results are a radiant, glossy sound rivaling the best of Harnoncourt or Pinnock. Bartoli’s fluttering vocal line is at odds with the instruments and one longs for the more sympathetic stylistic approach of Teresa Berganza and Victoria de los Angeles, who began their careers singing early music. The Swiss Radio chorus has yet other ideas about style, offering a slightly disingenuous enthusiasm and a thicker sound than I Barochisti. All parties involved, aside from a few grainy-voiced choristers, are fine, even superb musicians, but the sum total is far from homogenous or satisfying. Aside from the fact that the pieces were written and premiered in St. Petersburg, there is little that has to do with this city, or with Russia, and Cecelia Bartoli has as much to do with St. Petersburg as Audrey Hepburn had to do with Natasha Rostova in the Hollywood version of War and Peace.